Tristes Tropiques is one of the great books of our century," said Susan Sontag. "It is rigorous, subtle, and bold in thought. It is beauti-fully written. And, like all great books, it bears an absolutely personal stamp; it speaks with a human voice." Tristes Tropiques was an immensely popular bestseller when it was first published in France in 1955. Claude Lévi-Strauss's ground-breaking study of the societies of a number of Amazonian peoples is a cornerstone of structural anthropology and an exploration by the author of his own intellectual roots as a professor of philosophy in Brazil before the Second World War, as a Jewish exile from Nazi-occupied Europe, and later as a world-renowned academic (he taught at New York's New School for Social Research and was French cultural attaché to the United States). Lévi-Strauss's central journey leads from the Amazon basin through the dense upland jungles of Brazil. There, among the Amerindian tribes--the Caduveo, Bororo, Nambikwara, and Tupi-Kawahib--he found "a human society reduced to its most basic expression." 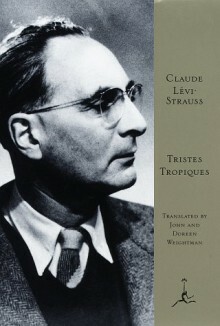 Lévi-Strauss's discussion of his fieldwork in Tristes Tropiques endures as a milestone of anthropology, but the book is also, in its brilliant diversions on other, more familiar cultures, a great work of literature, a vivid travelogue, and an engaging memoir--a demonstration of the marvelous mental agility of one of the century's most important thinkers. Presented here is the translation by John and Doreen Weightman of the complete text of the revised French edition of 1968, together with the original photographs and illustrations. The Modern Library has played a significant role in American cultural life for the better part of a century. The series was founded in 1917 by the publishers Boni and Liveright and eight years later acquired by Bennett Cerf and Donald Klopfer. It provided the foun-dation for their next publishing venture, Random House. The Modern Library has been a staple of the American book trade, providing readers with affordable hard-bound editions of important works of liter-ature and thought. For the Modern Library's seventy-fifth anniversary, Random House redesigned the series, restoring as its emblem the running torchbearer created by Lucian Bernhard in 1925 and refurbishing jackets, bindings, and type, as well as inaugurat-ing a new program of selecting titles. The Modern Library continues to provide the world's best books, at the best prices.